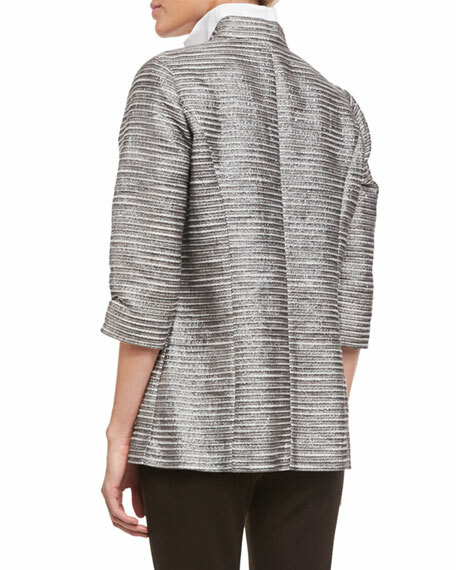 Misook "Silver Linings" jacket in textured metallic line pattern. Small stand collar; open front. 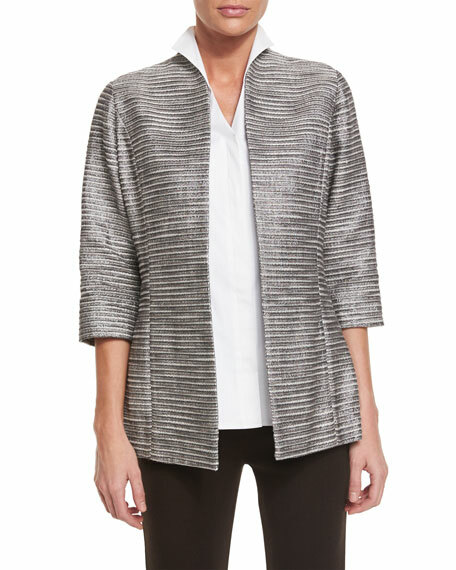 Eileen Fisher cardigan in polished interlock knit. Shawl collar; open front. Three-quarter sleeves. Patch pockets at hip. Relaxed, lightly shaped silhouette. Hem gracefully falls below hip. Seam accents small of back. Silk/organic cotton; hand wash. Imported. Elie Tahari "Jaquelyn" linen jacket with a metallic finish. Spread collar; concealed zip front with button placket. Long sleeves with hidden button cuffs. Side zip pockets below chest. Front flap pockets. Tailored silhouette. Cropped length. Straight hem. Linen/polyurethane. Polyester lining. Dry clean. Imported. Elie Tahari "Jezebel" metallic jacket with golden buttons. Peak lapels; double-breasted button front. Long sleeves; button cuffs. Left chest welt pocket. Side flap pockets. Tailored silhouette. Cutaway hem. Linen. Dry clean. Imported.